The 1 oz Canadian Maple Leaf Gold Coin is one of the world's most popular gold bullion coins. This high quality gold coin was first issued in 1979. Since that time, over 25 million ounces have been sold worldwide. The Royal Canadian Mint excels in high purity bullion coins, and the Gold Canadian Maple Leaf Coin was the first gold coin ever to be minted at .9999 fineness (99.99% pure gold). Like the American Gold Eagle Coin, the Canadian Gold Maple Coin is purchased more frequently than many other modern gold bullion coins, particularly in North America. The Canadian Gold Maple Leaf Coin's design has the universally recognized symbol of Canada, the maple leaf, on the reverse side along with the gold bullion coin's purity and weight. Queen Elizabeth II appears on the obverse side surface with the gold bullion coin's face value and year of issue. Despite volatility in historic spot gold prices and consequently gold coin prices, the Canadian Maple Leaf Gold Coin remains a favorite for gold investors and collectors alike. This Canadian gold bullion coin is also available in smaller sizes than this 1 oz version like fractional Gold Maple Leaf Coins (1/2 oz, 1/4, oz 1/10 oz, 1 gram). The Canadian Gold Maple Coin is one of the best bullion gold coins to buy, because the Royal Canadian Mint creates gold bullion coins that meet the highest standards of security, and which are recognized and accepted by gold bullion dealers world wide. Kitco also offers the option of pristine Canadian Gold Maple Coins in an exclusive MintFirst™ format. Whether purchased as single gold coins, or in Royal Canadian Mint gold coin tubes containing 10 gold coins, buying MintFirst Canadian Gold Maple Leaf Coins gives you the assurance that you are the first one to appreciate the luster and detail of each newly minted Gold Maple Leaf Coin. Canadian Gold Maple Leaf Coins are also eligible for retirement savings in a Gold IRA (USA) or Gold RSP (Canada). Find out more about how Kitco can help you hold Royal Canadian Mint gold coins like the Canadian Gold Maple Leaf Coin as part of your retirement savings. Gold Maple Leaf Coins also make a great gift. Add a beautiful wooden gift box to make a present of a single gold bullion coin extra special. Possibly consider Gold Maple Leaf Coins as a present for a wedding or graduation. Give your children the gift of gold bullion to start them on a path to financial security. Stay tuned to Kitco to monitor live gold coin prices and the latest news in the gold bullion market. The Royal Canadian Mint is a Canadian crown corporation that mints all of Canada's circulation coins. Since it released Canada's first domestically produced coin in 1908, the Royal Canadian Mint has acquired a global reputation for gold bullion coin minting excellence. Today, the Mint's superior technical capabilities also allow it to set new benchmarks in gold coin design and quality and even make it the producer of choice for many foreign countries' official circulation coinage. You can store your 1 oz Gold Maple Leaf Coin safely and securely with Kitco Allocated Storage. Kitco offers you global options for gold, silver and platinum bullion storage that is fully segregated, insured and allocated. Kitco's network of top-tier vaults includes some of the most secure storage facilities in the world, in Canada, Hong Kong or the United States (COMEX approved). Cayman Islands storage is also available (certain conditions apply). Find out more about keeping your gold, silver and platinum purchases secure, with our Global Precious Metals Storage Solutions. 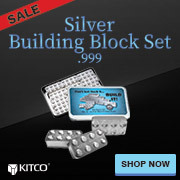 Kitco is a trusted leader in the gold bullion and precious metals industry. Gold coins and other physical precious metals sold by Kitco are recognized in gold bullion markets around the world. With our focus on gold bullion, you can benefit from our low gold coin prices and premiums that are highly competitive in the gold bullion coin industry.